So I may be 12 years late to the game here, however there is always a young generation of baseball fans that could benefit from this review. I happened to stumble upon this movie only after a friend at work recommended it with high praise and scolded me, a baseball fan, for not having watched this apparent classic. After giving it a go, let’s just say, the movie truly belongs in the minor leagues. While I won’t give away enough information to ruin the movie, I should offer a spoiler alert as relevant pieces of the plot may be discussed. I was astonished to see how well received the movie was around the internet world. Rotten Tomatoes gave it a whopping 98% approval rating while many lists tabbed the film as one of the greatest sports movies of all-time. One of these lists comes naturally from my employer, ESPN, which gave ‘Bull Durham’ the #1 spot. While it is unconventional wisdom to argue against The Man, I would have to kindly disagree, noting that in my opinion, the movie does not even rank as the greatest baseball movie of all-time (outranked by ‘Field of Dreams’ and ‘Major League’). The fact that one has to question whether ‘Bull Durham’ is a sports movie or a romantic comedy drops it down a notch in my books. Too much of the focus was put on the romantic triangle, which took away from the essence of the movie (supposedly baseball). No other movie in the ESPN Top 5 offers that type of genre ambiguity. You basically get what you pay for with the others. Before I start sipping on the “haterade”, I should mention the positives that came out of the movie. I thought the character of Kevin Costner, “Crash” Davis was perfectly executed throughout the movie. A washed up, aging, veteran catcher whose only role at this stage in his career is to help the growth of others. It made complete sense for the team to go a different direction when “Nuke” was called up. As Crash closed in on the all-time Minor League homerun record, the underlying negative connotation associated with it made it understandable why he did not want any spotlight shone on the milestone. Many of the lessons passed onto Nuke (including how to throw a punch in a bar fight) were very believable. I also thought Susan Sarandon was well cast as Annie Savoy, the passionate middle-aged fan and unofficial trainer of the Bulls. She executed her scenes well playing the Bulls groupie and lusting after the men she truly desired. Now that we got that out of the way, let’s harp on where the movie went wrong. I think it started with a horrible miscasting of Nuke Laloosh. Tim Robbins really did not seem to be the right fit for a flashy, young kid with a rocket arm. In fact, his rambunctious pitching motion was pathetic to watch as a baseball fan. As a Hollywood actor, one would think that he could train for the role. While I may be slightly biased against Robbins having seen him in more serious roles like ‘Shawshank Redemption’ and ‘Mystic River’ before watching this movie, he didn’t exude the essence of a cocky young kid trying to make it in the big leagues. Perhaps Woody Harrelson back in the late 80s could have worked better? It also didn’t make sense for the character to be exclusively pining after Savoy, a clingy 40+ year old. One would think that a guy in his position would be a bit more promiscuous with less attachments. Another problem I had with the movie was the aspect of realism. Ron Shelton, the director, was a former minor league baseball player and in the DVD commentary mentioned how he wanted to genuinely portray life in the minor leagues. While some elements worked well, others I think started becoming evident of a Hollywood movie. I may be especially acute to observation here given the timing of Stephen Strasburg coming up in the ranks. It was uncomforting to note that pitch count was never an issue with Nuke in his appearances. The 18 K/18 BB debut seems downright unbelievable. Later, we find Nuke going the distance, working on a 2-hit shutout in the 9th inning in a game that is well out of hand. It just didn’t seem natural for the development of a young pitcher. Strasburg has been on tight pitch count limitations throughout his minor league starts. In 5 Double-A appearances, Stephen pitched 22 innings and in his Triple-A debut, was pulled after 6 innings of 1-hit ball in just 65 pitches. I also found it hard to believe that a pitcher could jump from Single-A ball straight to MLB, especially considering how Nuke wasn’t exceptionally outstanding in his minor league stint. Strasburg, often considered the top pitching prospect in over 20 years has paid his dues in Double-A and is working his way up from Triple-A before inevitably getting the call up from the Washington Nationals. I may be harder on the movie simply based on the hype coming in. Had I watched it on my own, independent of recommendation, there is a good chance I wouldn’t have even bothered writing a review. 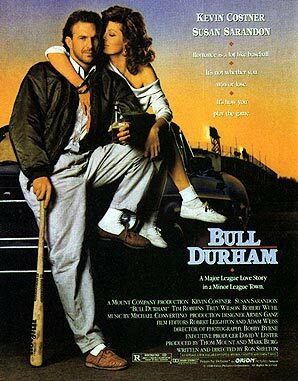 While I expected absurdity from ‘Major League’, I expected a more sophisticated portrayal of real life in ‘Bull Durham’, and the movie failed in that regard. What else bothered me were the rave reviews and high acclaim that I feel were not warranted for an otherwise romance filled sports movie. The baseball scenes were often limited to the battery interaction between Nuke and Crash with little emphasis shone on other aspects of the field/players. While I could easily watch ‘Major League’ once a year on TNT, I wouldn’t be shocked to find ‘Bull Durham’ on Lifetime and would pass on the opportunity to watch a second time. This entry was posted in Movies and tagged Bull Durham, Movie Review. Bookmark the permalink. Both comments and trackbacks are currently closed.